When I think of Kentucky I think of the Derby, bourbon, and the once formidable Wildcat basketball program. The image of wild buffalo charging through untamed wilderness simply doesn’t resonate. But this aptly named spirit was born of a frontier settlement that grew from trails (or “traces”) carved by buffalo herds. Built on the banks of the Kentucky River near Frankfort, the distillery, according to its website, “embraces the heritage created by brave pioneers, hopeful settlers, and Kentucky’s native sons who left their marks as legends, heroes, and leaders.” The fertile land, uniquely situated amid abundant limestone and spring water, has been home to a working distillery since 1787, and today the sprawling operation includes 119 acres and 114 buildings. Whether or not you buy into the magic of the location, you can’t dispute Buffalo Trace’s results. The distillery—which also produces Blanton’s, W.L. Weller, Old Charter, and Eagle Rare—has won more international awards since 1990 than any other North American operation, not to mention Whiskey Magazine’s “Distiller of the Year” award in 2005. 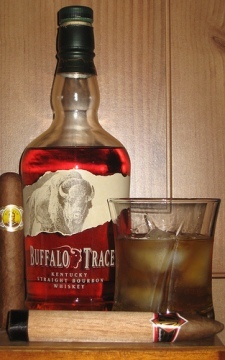 Buffalo Trace Kentucky Straight Bourbon Whiskey is their flagship line, launched in August 1999 shortly after the distillery was renamed from George T. Stagg. It is made from Kentucky and Indiana corn, rye, and superior malted barley. Double distilled and aged in select barrels (Buffalo Trace sports the highest rejection rate of barrels in the industry), a 750 ml. bottle sells for a reasonable $18-25. Turning copper red to a golden brown when poured from the bottle to a glass, this bourbon boasts notes of mint, oak, molasses, and pepper on the nose. A slight burning tinge is apparent but mostly in the background of the aroma’s character. While all of these scents are noticeable in the taste, the predominant flavors are vanilla and honey. And where many bourbons overstay their welcome, Buffalo Trace fades away quietly like the end of a catchy tune on an old album. Still, this is a hearty bourbon that need not be treated as a fragile delicacy. Drink it on the rocks or in your favorite bourbon-based cocktail (it makes a great mint julep) and feel free to pair it with fuller-bodied cigars. Of those that I’ve smoked lately, the Cupido Tuxedo, Serie JJ Maduro, and Double Ligero Chisel pair nicely. Even though Buffalo Trace may not be the best, most complex bourbon on the market, it’s a damn good value for the money—and, for both sipping and mixing, it has carved a trail to my liquor cabinet. Great review. Along with Bulleit, which is a little bit spicier, this is one of my go to bourbons and a really fantastic bottle for the price. You guys have consistently delivered on your reviews of spirits – my alcohol consumption has benefited greatly since coming to this site. Will try to find this today . . .
Don't forget that this distillery also produces the wonderful Pappy Van Winkle's Family Reserve offerings and Sazerac rye whiskey. Grabbed a bottle on my way home from work – the review is right on the money. I would pay more than $20 for the Buffalo Trace. This is an excellent whiskey and yes the vanilla and honey are the predominant notes. I will go through this bottle very quickly.